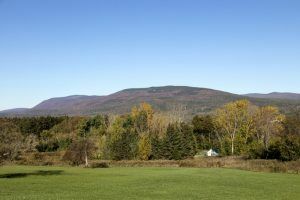 The Bennington Triangle, centered around Glastenbury Mountain in Vermont, has long been known for strange events including UFO activity, bigfoot sightings, strange lights and sounds, and the location where five people disappeared in the 1940s and 1950s. The area is said to be cursed according to Native American lore. The Indians of the area had long been wary of the area and avoided it. An Algonquin legend warned of a malevolent stone in the mountains that would open up and devour anyone unlucky enough to step on it. The phrase “Bennington Triangle” was coined by New England author Joseph A. Citro in 1992 who said the area shares characteristics with the Bridgewater Triangle in neighboring Massachusetts. 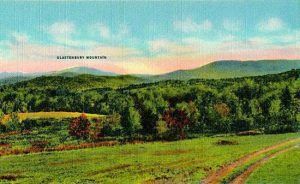 The stretch of woodlands around Glastenbury Mountain includes the towns of Bennington, Woodford, and Shaftsbury, as well as the ghost towns of Somerset and Glastenbury. 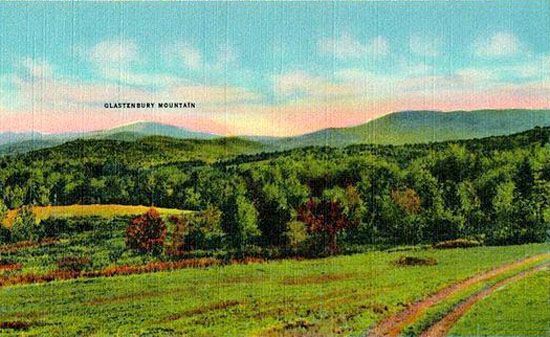 For more than two centuries there have been numerous sightings of a bigfoot-like creature in the Glastenbury Mountain area which became known as “The Bennington Monster.” One of the first reported sightings occurred in the early 1800s when a stagecoach full of passengers was forced to stop on a washed out road. The stage-driver first noticed very large footprints in the mud that was too large to be a human’s. Then, the coach was attacked by a large creature who knocked the vehicle on its side. The frightened passengers could only see a pair of eyes before the monster roared and ran off into the forest. Later sightings described the creature as a large, hairy, black thing standing over six feet tall. There have long been stories of people going missing in the area, including a man named Carol Herrick in 1943. 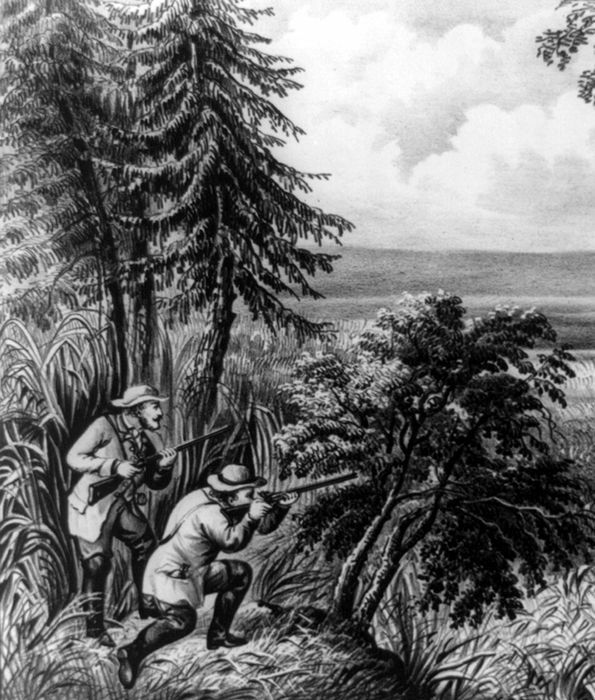 Herrick went missing during a hunting trip about 10 miles northeast of the ghost town of Glastenbury. His body was discovered three days later surrounded by huge, mysterious footprints. He had been squeezed to death. During a five-year span, beginning in 1945, people began to disappear with regularity. 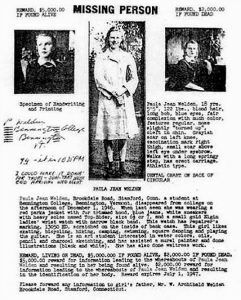 The first to go missing was a 74-year-old hunting guide named Middie Rivers on November 12, 1945. Rivers, who knew the area well, was leading a party of four hunters in the area of Hell Hollow in the southwest woods of Glastenbury. As he was leading the group back to their camp, he got ahead of them and never returned to camp. Initially, the other hunters weren’t concerned as their guide was a skilled woodsman. However, when Rivers didn’t resurface, an extensive search was conducted by 300 concerned locals and U.S. Army soldiers dispatched from Massachusetts’ Fort Devens. Though they combed through the vast wilderness for eight days, the only thing that was found was a rifle cartridge of the same type that Rivers used. There was no evidence of an animal attack and his body wasn’t found. Even after this exhaustive search, many locals believed that the knowledgeable woodsman would be able to survive and would soon resurface in town. But, he never did. Rivers disappeared along the Long Trail Road area and Vermont Route 9. A year later, 18-year-old college student Paula Welden went hiking on the Long Trail on Sunday, December 1, 1846. Wearing a bright red jacket, several people had seen her go including a store employee in Bennington who had given her directions and an elderly couple who were hiking about 100 yards behind her for a time. There was no concern until the college sophomore failed to show up for her classes at Bennington College the next morning. Afterward, an extensive search was conducted, which included more than 1,000 people searching, aircraft surveillance, the posting of a $5,000 reward, and help from the FBI. The elderly couple who had seen her on the trail said that after she turned a corner on the trail, she seemingly disappeared. During the massive search, no clues to her fate were ever discovered. Exactly three years after Paula Welden had disappeared, James Tedford went missing on December 1, 1949. A veteran resident of the Bennington Soldiers’ Home, Tedford had been in St. Albans visiting relatives, and was returning home on a bus when he vanished. According to witnesses, Weldon was one of 14 passengers who were on the bus at the last stop before arriving in Bennington. However, when the bus arrived in Bennington, he had seemingly vanished. His belongings were still in the luggage rack and an open bus timetable was on his vacant seat. No one had seen him get off the bus and he didn’t disembark in Bennington. Though the disappearance was investigated, no one had seen anything, nor did they report any suspicious incidents. On October 12, 1950, an eight-year-old boy named Paul Jepson went missing in the area. Jepson was playing in the cab of a pickup truck in Bennington when his mother left him briefly to tend to her pigs. When she returned, the boy was gone. After looking for the boy in the immediate area, he was reported as missing and hundreds of people assembled in a search party. 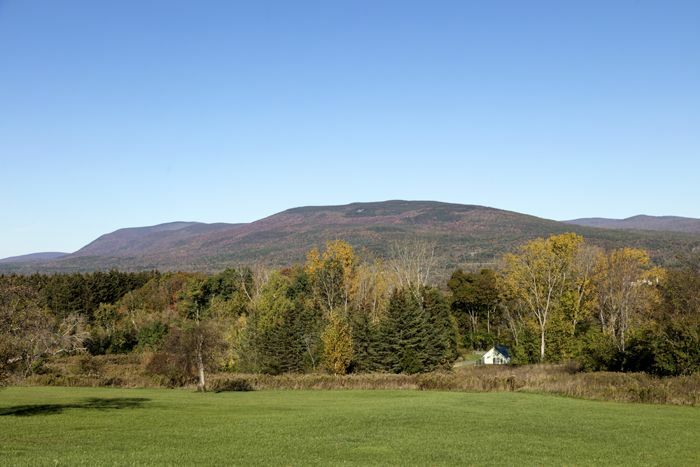 Bloodhounds were also brought in to search for the boy, which picked up his scent and followed it toward Glastenbury Mountain, but it was lost at a nearby crossroads, suggesting a possible abduction by a motorist. The boy’s father said that Paul had been talking about visiting the mountains for several days. Though the area was searched for several days, no clues or remains of the boy were ever found. 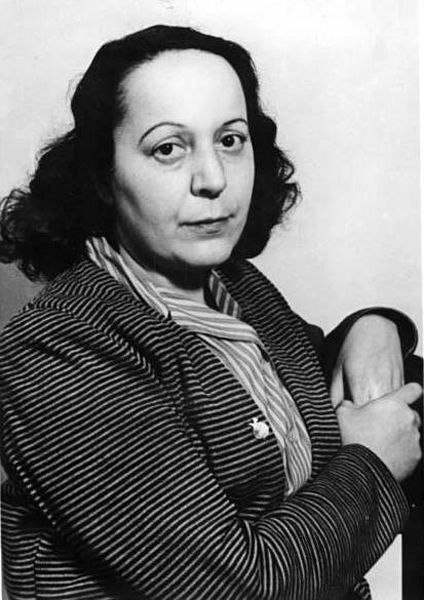 Just 16 days later, Frieda Langer went missing on October 28, 1950. She and several other family members were camping in the woods near Glastenbury Mountain. The 53-year-old Langer, along with her cousin, Herbert Elsner, left their family campsite near the Somerset Reservoir to go on a hike. However, when they were just a few hundred yards from their campsite, Langer slipped and fell into a stream, soaking her clothes and shoes. She then asked her cousin to wait as she ran back to the camp to change her clothes. After Elsner waited for a while and Freda didn’t return, he also went back to the camp to see if everything was alright. It wasn’t. Freda hadn’t returned to the camp. Instead, she had seemingly disappeared in broad daylight in the short distance. In the next few weeks, several search parties, which included some 400 people comprised of police, volunteers, firefighters, and soldiers, as well as aircraft, searched for her and turned up nothing. The search was finally called off. Then, seven months later, on May 12, 1951, her body was found near Somerset Reservoir, in an area that had previously been extensively searched. Due to the decomposition of the body, no cause of death could be determined. The case remains unsolved. Langer was the last person to disappear and the only one whose body was found. Though no direct connections have been found that tie these cases together, other than geographic area and time period, some claim these disappearances were the work of a serial killer. Others blame the Indian curse or the paranormal, stating the place is “window” into the unexplained. Some say the area is unstable due to wind patterns that are unusually chaotic and confusing, so people can easily get lost. Whatever the reason, the area is famous for its strange phenomena. 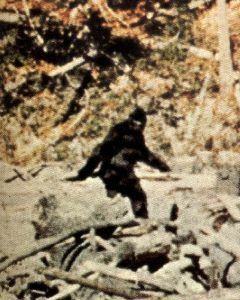 In addition to the Bigfoot sightings and disappearances, others have reported seeing strange floating lights, other mysterious woodland creatures, and UFO activity. Rural scene outside Bennington, Vermont by Carol Highsmith.